Amazon.com has fixed a problem with its iOS and Android mobile applications that would have allowed hackers unlimited guesses for a user's password. A gaping hole in Amazon.com's mobile application, now fixed, allowed hackers to have an unlimited number of attempts guessing a person's password, according to security vendor FireEye. 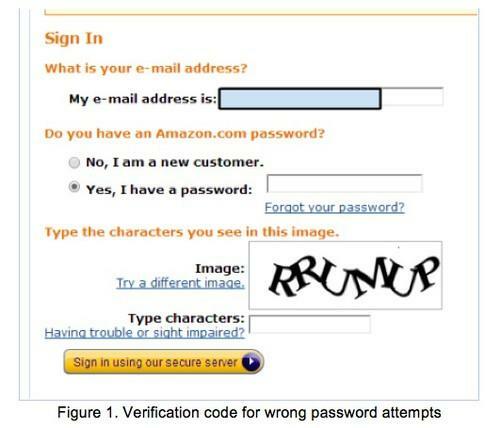 If users enter their password incorrectly 10 times on the Amazon.com website, the company requires them to solve the squiggle of characters known as a CAPTCHA (Completely Automated Public Turing test to tell Computers and Humans Apart). The CAPTCHA is intended to thwart automated programs that will rapidly try different passwords. But Amazon.com did not show a CAPTCHA on its mobile applications for the iOS and Android platforms, allowing unlimited guesses, according to FireEye researchers Min Zheng, Tao Wei and Hui Xue, who wrote of their findings on FireEye's blog. FireEye notified Amazon.com of the problem on Jan. 30, and Amazon.com told the security company on Feb. 19 it had been fixed. The username for many Amazon.com customers is their email address, which is usually easy for hackers to obtain. Due to other data breaches, there are large lists of commonly used passwords circulating on the Web, which could be incorporated into an automated program to see if an account can be validated. "What makes things worse, many people just use the same password across different websites, so attackers can control more accounts than just Amazon's after figuring out the password," Wei said via email. In a blog post, the FireEye researchers wrote that Amazon.com does not require so-called "strong" passwords. It is possible to use weak passwords such as "123456" and "111111," which puts accounts at risk. The researchers created an exploit for the 2.8.0 version of Amazon.com's Android shopping client that cracked the password of an account they created. "This exploit tried 1,000 incorrect attempts before it successfully cracked the password," they wrote. The problem may have been an oversight by Amazon, but Wei said "we have found security issues around passwords in many mobile apps from various vendors."